My husband, Colin, and I spent a few years previous to when we bought our land, checking out a variety of natural building projects- cob, stawbale, rammed earth, cordwood, houses, garden sheds, playhouses- in various states of construction, doing workshops and reading books about land development theories and off-grid possibilities. I remember walking into peoples’ homes, finished or not, and wondering when I would be the one answering questions in clay dusted work clothes, passing on the vision of a beautiful and healthy living space. A few weeks ago we hosted our house on the Pender Island Eco-Homes tour, and I was able to see myself in just that light as I greeted over a hundred people throughout the day. It’s been 4 years since we began the foundation, and 3 and a half years of living in a 23 foot trailer as a family of four in the mean time. We have worked beside a huge array of friends and community neighbors of all ages, with many of our materials being locally sourced. Buying into the land with us (and making the reality of the price affordable for us all!) is my mother Margaret, otherwise known as Nana. Colin and I have always welcomed the idea of shared land buying and building- we researched and looked into the prospect of larger, intentional community style projects here on Pender before this piece of land presented itself in such a way that we could not ignore. We asked around for anyone else who wanted to join in, but it seems to have worked out for us to get going with Nana and keep our doors open for future co-creators. The whole design of the house involves two more small levels descending down the rock slope in front of the part we have just finished building, which will be a level of bedrooms and a level with an open kitchen and living room for our growing f amily. The section we started with is a 590 square foot suite for Nana with a 290 square foot shared art studio. 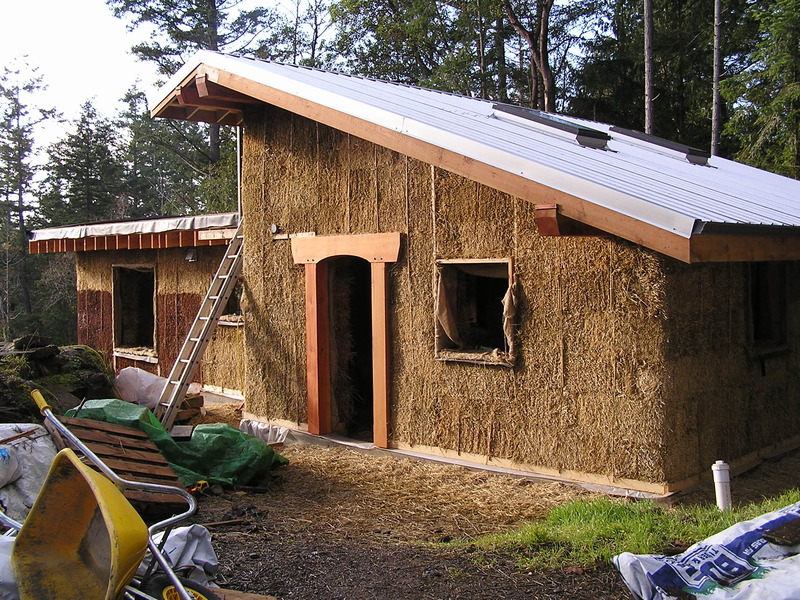 This strawbale house opens into a nice size mud room, with a door leading south to Nana’s kitchen, bedroom, and living room space all in an open format (the front section with the curved, living roof). A door leading north from the mudroom goes into the art studio and utility room (back section of house with sloping metal roof). Nana has been a great help with taking time with Taeven and Cedar, baking us bread and treats, making meals when we are working late, and adding her artistic touches when she can, as well as taking on any jobs she can help with. She also manages to help plant, weed, or harvest in the garden. Colin designed the floor plan himself with considerations of the passive solar capacities available through the south facing slope that we are building on. He hired our friend Garrett (McLoed Timber Framing) to design and work with Colin on the traditional wood jointed frame. We used beams salvaged from old bridge timbers by a company on Vancouver Island. The bales were bought from a family owned farm in Saanich, and we have covered them with natural plaster- a foot mixed combination of clay, sand and straw which is then spread over the bales by hand, and then covered with another layer smoothed by a trowel. A final coat of lime plaster seals in the whole wall system, keeping it breathable, dry and super insulating (Straw bales are reported to have an R value between 35 and 60!) We have a hydronic in-floor heating system laid beneath an earthen floor and cork flooring. This past summer we had a fabulous work party to get all the soil up onto our living roof, and it is now planted with native succulents and other sedums that I have been propagating over the last 2 years. 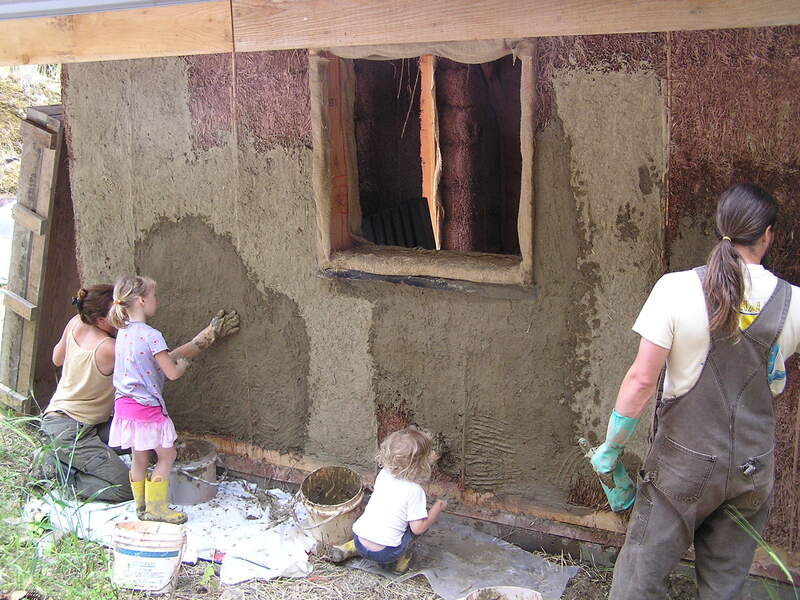 Now that we have finished this first half of the house, we are looking to move forwards with our other dreams of natural building while we are comfortably living in the incredible warmth of the strawbale timberframe. We have learned a lot about methods, materials, resourcing, creative problem solving, and most of all about ourselves and the balance between work, play, and expectations. Great post! Would you be able to tell me where you sourced the straw bales? 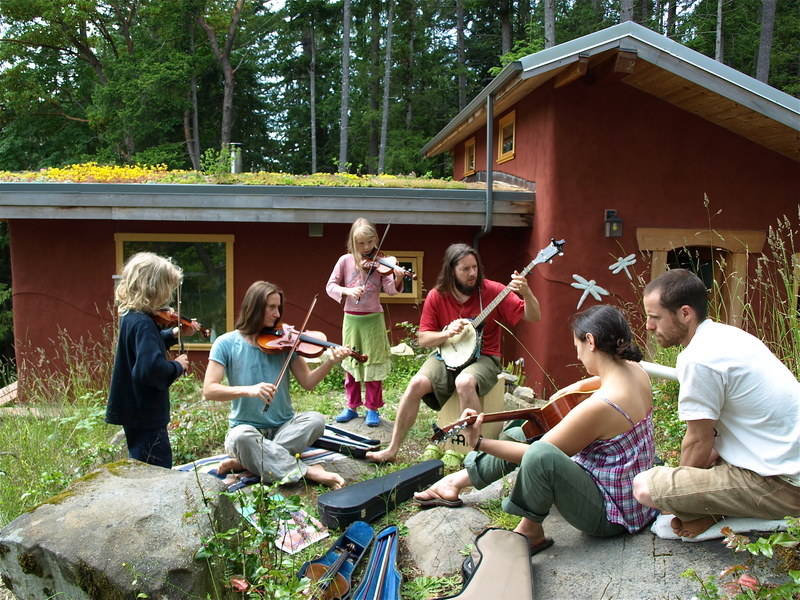 We are on Gabriola and currently designing a straw bale house but I’m having problems finding bales west of the rockies. Your house experience bodes well for what we hope for our modest house on 5.5 acres. Many thanks! Hello! We found our bales at Michell’s – a local family farm on the Saanich Peninsula, beside the Pat Bay Hwy at Island View rd. They had a surplus of barley bales that year. They were very helpful, (and glad for us to take away so many). Tightly baled too, with little seed content. Good luck on your project! Many thanks for your reply and the good wishes. I’ll have a look for Michell’s. Keep up the inspirational blogging!